The MV Moonlight cruise ship is a superior class vessel that comfortably accommodates 36 guests. The 18 spacious air-conditioned, en-suite cabins are arranged over two decks and feature elegant décor and furnishings, plus state-of-the-art amenities. 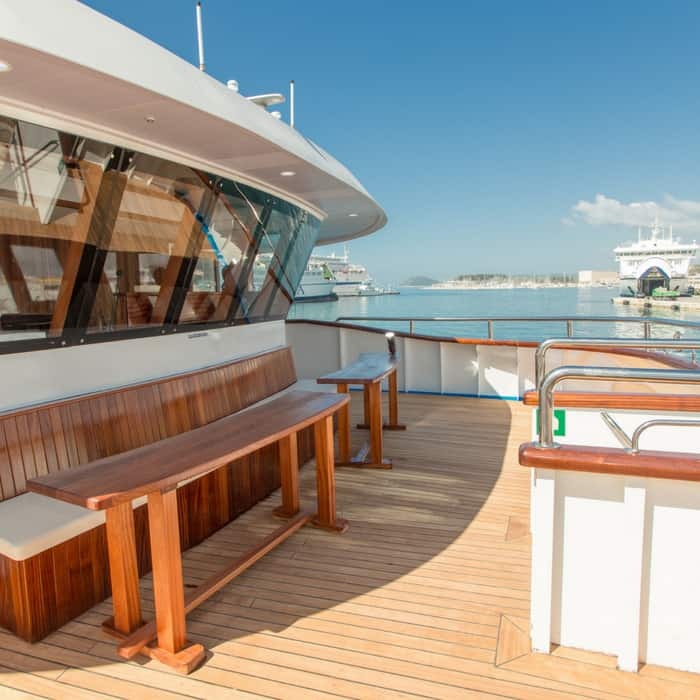 On deck there is a relaxing sun deck with plenty of loungers, a Jacuzzi, and a swimming platform to the rear.Inside you can get comfortable in the air-conditioned dining and lounge bar areas, and enjoy breathtaking panoramic views as the stunning Croatian coastline slips by. The beautifully appointed cruise ship and her crew promise an excellent, personalised service for an unforgettable sailing holiday experience. MV Moonlight is a 37.4m (123ft) long, 8.2m (26.5ft) wide luxury vessel, with a cruising speed of nine nautical miles. Built in 2017 with latest state-of-the-art equipment and amenities. Maximum capacity of 36 passengers in 18 twin or double cabins, guaranteeing an intimate setting for all guests. 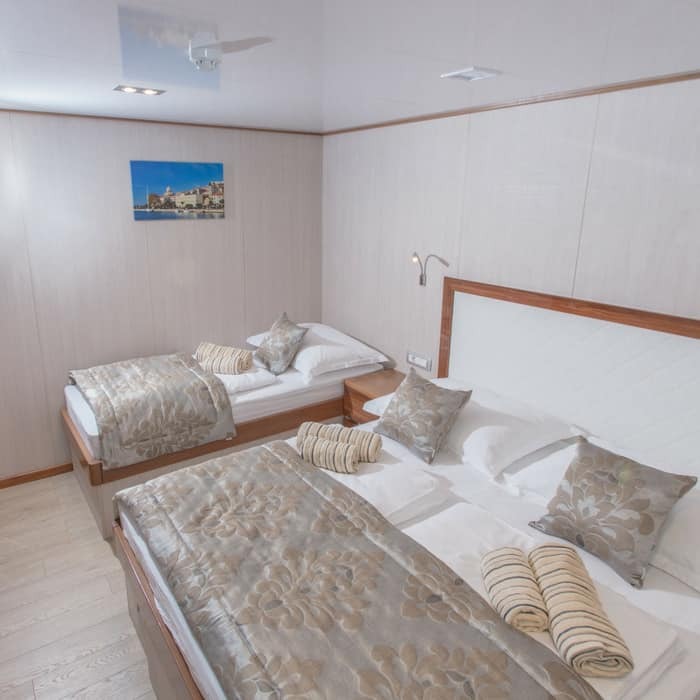 She features modern cabins, fully equipped with air conditioning, safety deposit box, fire alarm, emergency lights and audio system for announcements by the Captain or Cruise Director. In addition each cabin has life jackets, desk and tabouret, wardrobe, night stand, small sofa and a porthole window. Bathrooms equipped with toilet, shower, sink and hair dryer. All cabins have indoor passage access to the bar and restaurant area (except two main deck cabins that are connected to restaurant via deck). The large sun deck has a total surface of 250 m2 with partial sun-shade cover of 70 m2 and comfortable deck-beds for all passengers with access to Jacuzzi. The vessel has a rear platform to the sea with ladders for easy access into the sea and the deck has two outdoor showers and two deck toilets. Located over two decks, all 18 en-suite cabins have been designed to give space and ultimate comfort without compromise. 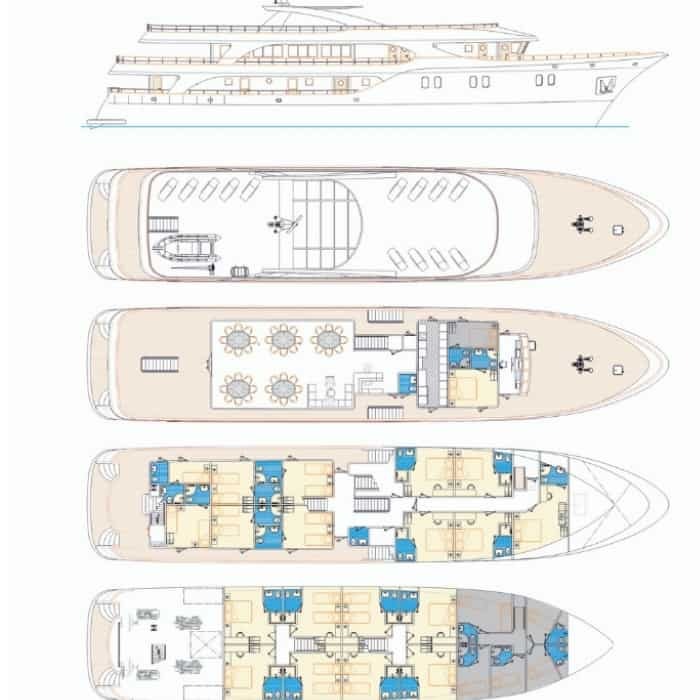 There are 10 main deck cabins and eight lower deck cabins. Each cabin accommodates a desk, wardrobe, night stand, small stool, sofa, and fixed hairdryer. All cabins are air-conditioned and have a safety deposit box, fire-alarm and audio system for announcements by the Captain or Cruise Director. MV Moonlight has an abundance of space and relaxation areas. 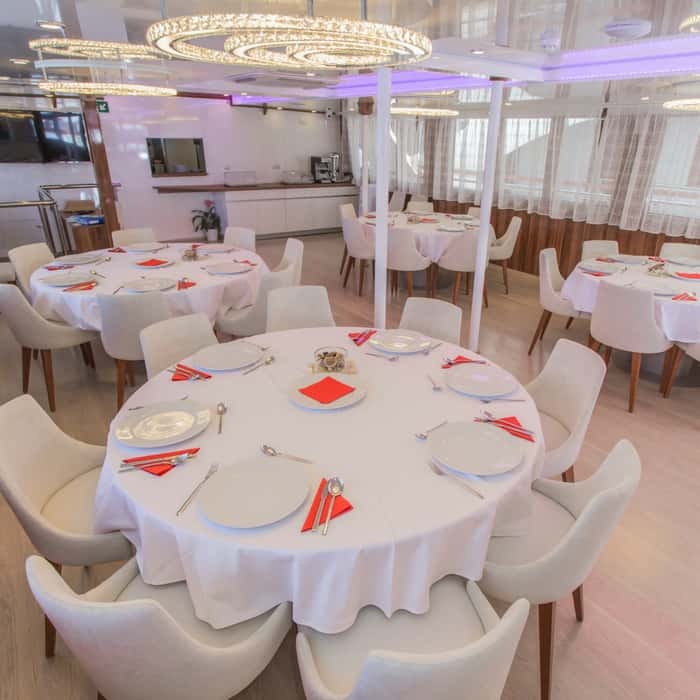 The main deck dining room is fully air-conditioned with an indoor bar and lounge area with LCD Television, plus a corner buffet breakfast table. 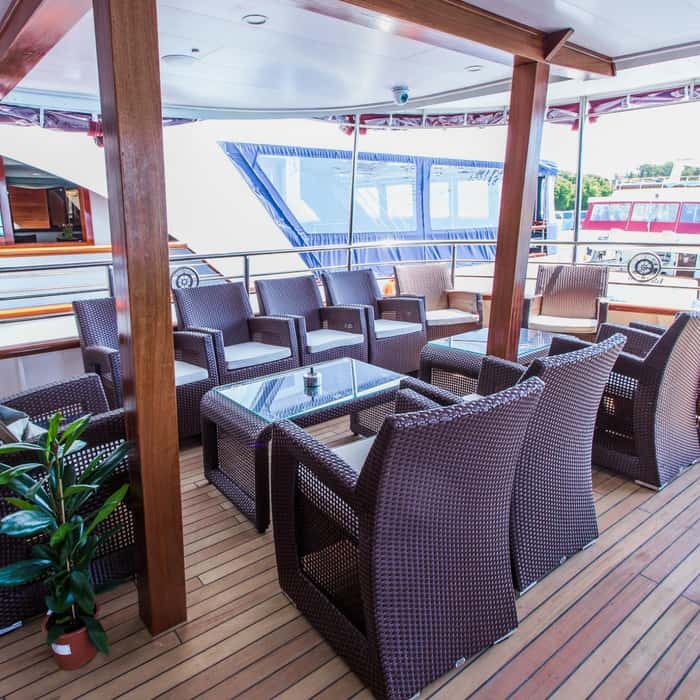 There are plenty of lounging areas including comfy seating on the rear of the main deck, and a huge top deck which is partially shaded offering deck-beds for all passengers and Jacuzzi. To make the most of every swimming opportunity there is a platform with steps and a ladder for easy access to the water, and also two outdoor showers, and two deck toilets.